Strawberry season came and went and I enjoyed every bit of it! I am lucky enough to have access to a local family farm, Larriland farm, which grows many varieties of crops where you can go and harvest at your own pace. 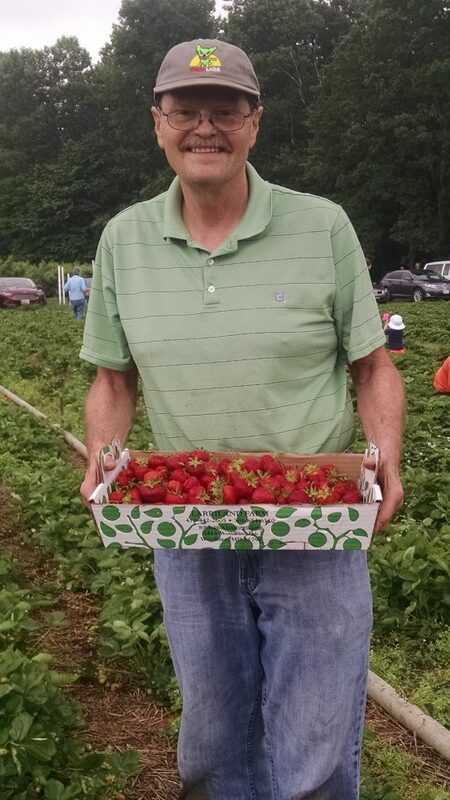 My husband and I look forward to the farm opening each year with strawberries as the first crop available for picking and eating. We used to go with our young children and now without children and we still enjoy it. Each time we go now we share the experience with them via text messages with photos of the farm and our pickings. One of the better uses of technology, I say. The drive to the farm allows us to see other farms along the way, large open areas with crops just starting. During strawberry season in May, the weather is still pleasant, so during the drive windows can be fully open allowing you to feel the breeze, smell nature, and your eyes can feast on the expansiveness and beauty of the countryside. We love and enjoy going to the farm for the earthy feeling, the feeling of peace, and of wholesomeness, and of course, for the delicious fruits and vegetables. 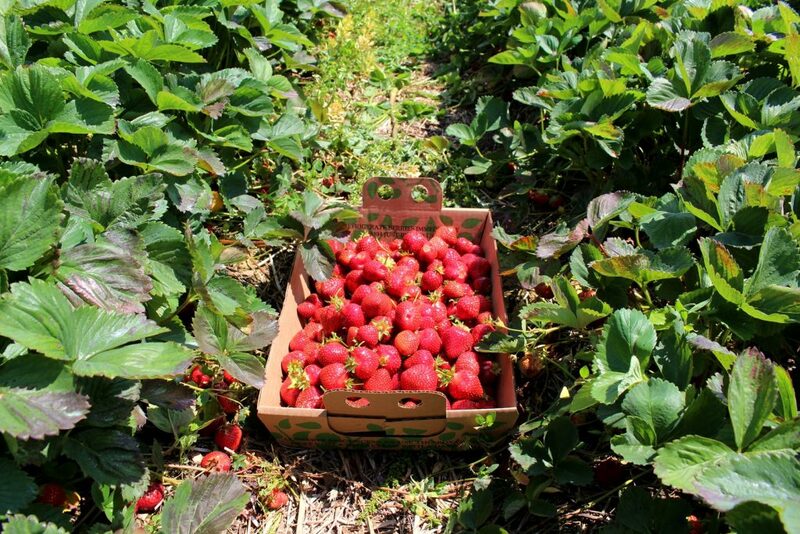 This year, upon arrival and after getting the harvesting carton I looked out to the field and immediately these words came to mind…..strawberry field forever…..of course I could not shake off the tune from my head while picking that day. Another of the delightful things about going to the farm is seeing the families with young children because they get so into it, that is eating more than picking. I must confess I am not very different from them. My husband does most of the picking because I am mostly busy eating and taking photos. But What is a Strawberry? Technically strawberries are neither “berries” nor “fruits”. A strawberry is the enlarged receptacle of the flower surrounded by many seeds, technically called achenes. Strawberries are technically an “aggregate accessory fruit”, a collection of fruits, with each ‘seed’ considered by botanists as a separate fruit. Each of those individual fruits has a seed inside. On average there are 200 seeds on a strawberry. Raspberries and blackberries are also aggregate fruits, all popularly called berries. What the seeds (achenes) do is stimulate the tissue below so it grows around the seed enlarging the receptacle in the process and soon enough we have a delicious strawberry! How good are strawberries for you? As the poet Elizabeth Barrett Browning said…..let me count the ways. Strawberries are a major source of antioxidants. Enhance cognitive function and motor function. Increases the good cholesterol (HDL). Improves regulation of blood sugar, decreasing the risk of type 2 diabetes but you must eat at least 3 servings a week, 1-cup (one serving) is about 8 strawberries. Protects against inflammation-related diseases such as rheumatoid arthritis as well as inflammation related diseases of the eyes. Strawberries are a good source of manganese, potassium, biotin, phosphorus, vitamin B6, and omega-3 fatty acids. 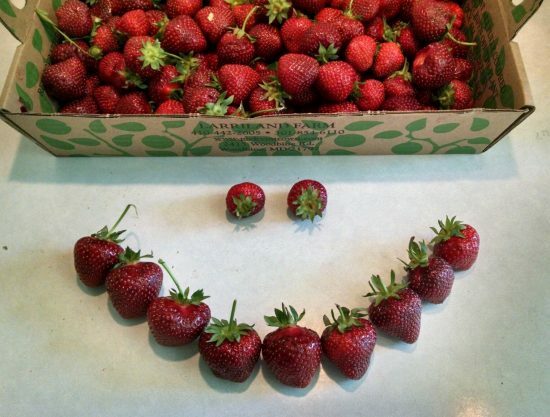 Strawberries may look small with an average weight of 1-2 grams but they are loaded with a lot of goodness. Wild strawberries have been known to man for more than 2000 years. 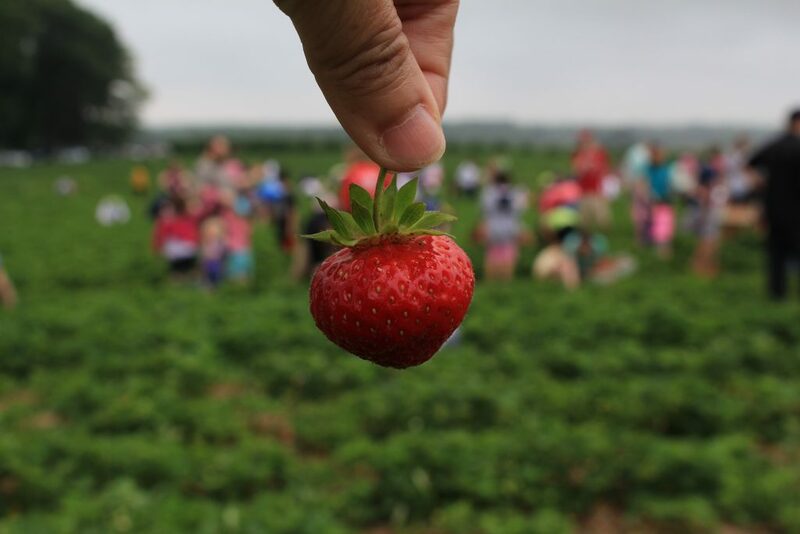 They were growing in North America and Europe for a long time but it was not until the 18th century when a major development occurred to bring us the strawberry we know today. 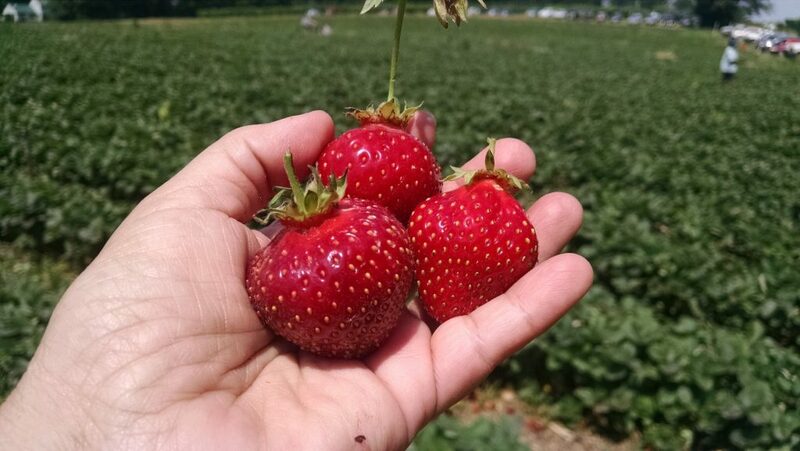 In 1714 a French engineer who went to Chile and Peru to monitor Spanish activities noticed a strawberry native to the region that was much larger than those grown in Europe. Upon his return, he brought back many plants that were cross-bred with many local plants. However, the creation of the strawberry we know today came about only when the American species from Virginia (Fragaria virginiana) and the Chilean species were crossed. This new strawberry, Fragaria ananassa, had fewer but larger flowers producing larger fruit that was much sweeter. 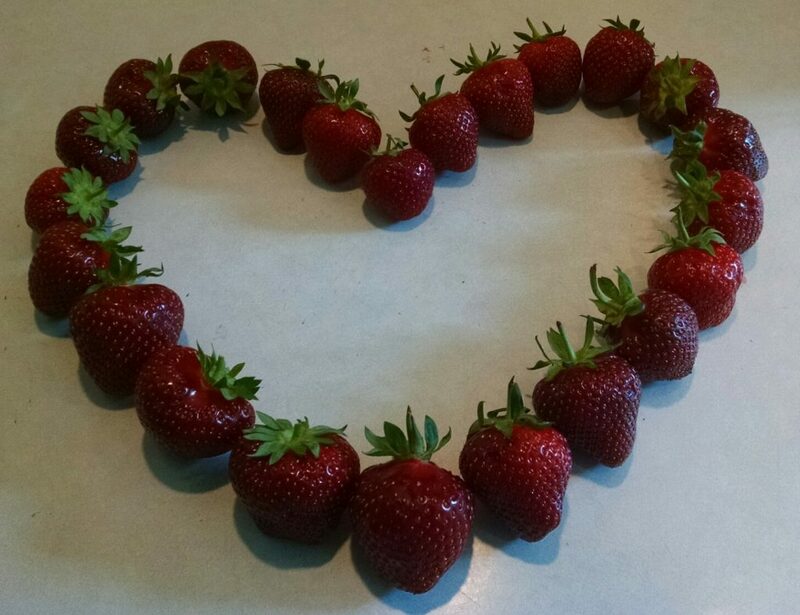 The strawberry is the symbol for Venus, the Goddess of Love because of its heart shape and red color. Ancient Romans used them to treat everything from depression, to fainting, to fever, kidney stones, bad breath and sore throats. The French believed they were an aphrodisiac, isn’t everything an aphrodisiac?! The strawberry is a member of the rose family, can you believe that? On average there are 200 seeds on a strawberry. They are the best eaten fresh and uncooked in order to obtain the maximum amount of nutrients and taste. The maximum time for strawberry storage without major loss of vitamin C and polyphenol antioxidants is two days. Optimal storage conditions are: 36F and 90-95% humidity. Once picked, they don’t ripen anymore. 1-cup of strawberries is about 8 good size strawberries. 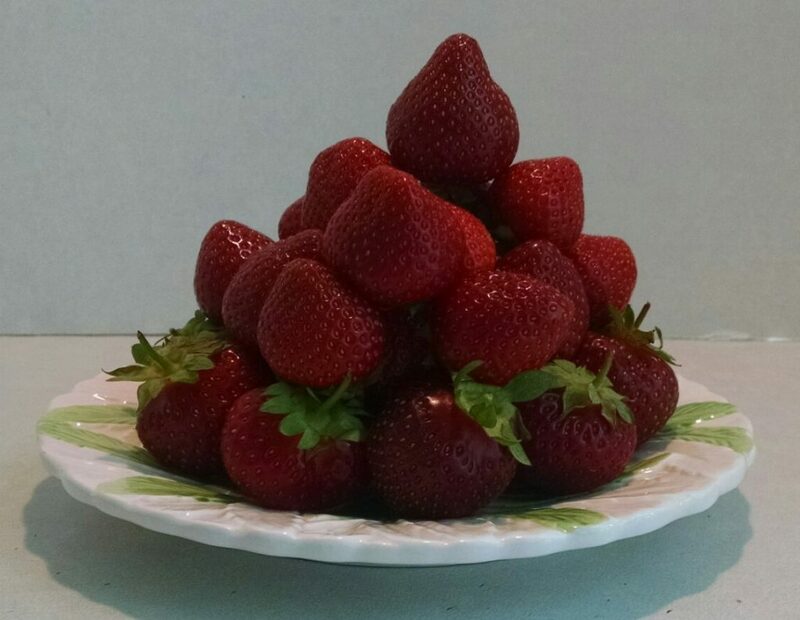 Strawberries are the fifth highest consumed fruit by weight in the United States. California is the largest producer in the USA, Florida is a distant second. In 2014, more than 2.3 billion pounds of strawberries were harvested in California which is 88% of the US strawberries. All strawberries are harvested by hand! In conclusion, as the proverb says, good things come in small packages, this definitely applies to the strawberry. My only sadness is that the local harvesting season is so short because there is nothing more delicious than eating a strawberry just picked from the plant. What is the next crop at the local farm? Blueberries….hurray!